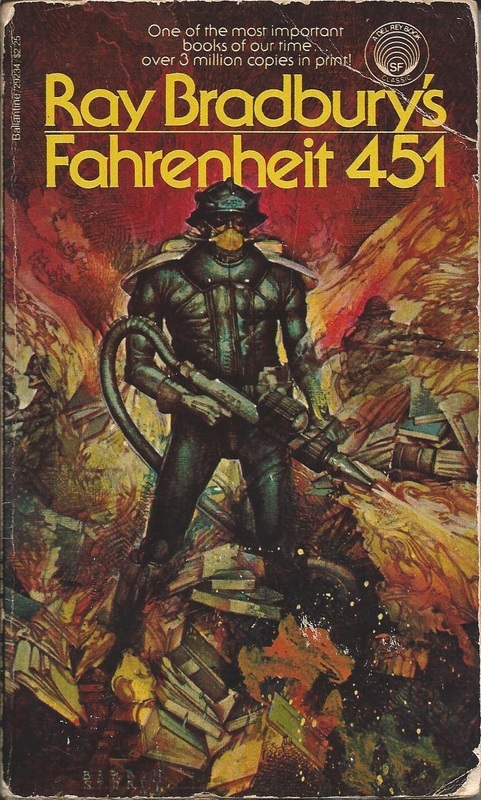 For good reason, Ray Bradbury’s Fahrenheit 451 remains a very popular book over 60 years since its debut, and it often is read in English classes in college or high school. When I was 12 or 14, I read the copy pictured at right probably 8 times, just as I did with Heinlein’s Space Cadet. I seem to recall doing a book report on it in high school, too. When I started really looking into Chief Beatty’s discussion of “technology, mass exploitation, and minority pressure” in the mid-1990s, I was surprised that only a fairly limited amount of criticism on the novel existed. Moreover, critics simply had not addressed some of the issues that I myself found crucial. Now, essays of mine that first appeared in academic journals have been reprinted in various textbooks on Bradbury or in the Contemporary Literary Criticism series which some libraries carry, and students of course also often can access these articles in the online literary research databases to which their institutions’ libraries subscribe. Most recently, Salem Press asked me to put together a new volume of original criticism on Fahrenheit 451, which was released in December 2013, and currently I am finishing a volume covering the breadth of the works of Ray Bradbury. Below is a list of what I have written on Bradbury, with links to the full-text articles wherever available. ​ “About This Volume.” vii-xii. “On Ray Bradbury and His Works.” xiii-xxvii. “Chronology of Ray Bradbury’s Life.” 209-13. “Bradbury the Master: Review of David Seed, Ray Bradbury.” Forthcoming in Extrapolation​, 2017. Extrapolation 57 (Fall 2016): 366-69. First-page preview available online here. (Winter/Spring 2013-14): 30-32. Available online here. Blame, and the Bomb in The Martian Chronicles and Fahrenheit 451.” 62-74. “Chronology of Ray Bradbury’s Life.” 232-36. “Works by Ray Bradbury.” 237-38. New World, and Fahrenheit 451.” Critical Insights: Dystopia. Ed. M. Keith Booker. Critical Insights Series. Ispwich, MA: Salem, 2013. 125-41. Contemporary Fiction 39 (Spring 1998): 282-87. Press Literary Companion Series. San Diego: Greenhaven, 2000. 55-62. Rpt. in Contemporary Literary Criticism 235. Ed. Jeffrey W. Hunter. Detroit: Gale, 2007. 120-23. First-page preview available online here. Listed in Jonathan R. Eller and William F. Touponce. Ray Bradbury: The Life of Fiction. Kent, OH: Kent State UP, 2004. Listed in Ray Bradbury, new ed. Ed. Harold Bloom. Bloom's Modern Critical Views Series. New York: Infobase, 2010. 222. Press Literary Companion Series. San Diego: Greenhaven, 2000. 66-75. First page preview available online here. Series. Westport, CT: Greenwood, 2000. 54. Westfahl. Westport, CT: Greenwood, 2005. 1030. Extrapolation 37 (Fall 1996): 245-56. Rpt. in Contemporary Literary Criticism 235. Ed. Jeffrey Hunter. Detroit: Gale, 2007. 114-20. Series. Westport, CT: Greenwood, 2000. 53-54. Listed in Ray Bradbury, new ed. Ed. Harold Bloom. Bloom’s Modern Critical Views Series. New York: Infobase, 2010. 222. Listed in “Fahrenheit 451.” Wikipedia.org (“Further Reading”). URL: http://en.wikipedia.org/wiki/Fahrenheit_451. “[Hands in] Bradbury’s Fahrenheit 451.” The Explicator 54 (Spring 1996): 177-80. Critical Interpretations Series. Philadelphia: Chelsea House, 2001. 105-8. Rpt. in Contemporary Literary Criticism 235. Ed. Jeffrey Hunter. Detroit: Gale, 2007. 112-14. Listed in Jonathan R. Eller and William F. Touponce. Ray Bradbury: The Life of Fiction. Kent, OH: Kent State UP, 2004. 558. Listed in Harold Bloom, ed. Ray Bradbury, new ed. Bloom's Modern Critical Views Series. New York: Infobase, 2010. 222.